I woke up at 3:30am and my first thought was, “What if my alpacas get flees?” It would be a reasonable question… If I had alpacas! It all started partly because my wife is afraid that opossums will eat our beloved chickens. In turn, for the past 2 or 3 months, every morning I am forced to hump the chickens out to their pen and every night I have to drag them back in to the brooder. Mind you, the chickens are fully grown. So I researched chickens and that led me to Justin Rhodes’s farm video tour, who did a video about a family that raised sheep, to get the wool, to spin the yarn, to knit the hats… In The House That Jack Built. That sounded really interesting, so on a whim I looked up wool and that led me to alpacas who turn out to be great guard animals for… wait for it… chickens! We won’t be getting alpacas. I live in town and the bees and the chickens are already pushing the limits of the city ordinances. I give the neighbors honey (and eggs when they start laying) but not a lot of people would be swayed with the gift of an alpaca fleece. However, one day when we buy a place in the country… well… who knows. Noah and I visited both of the apiaries Saturday and all the bees are doing well. 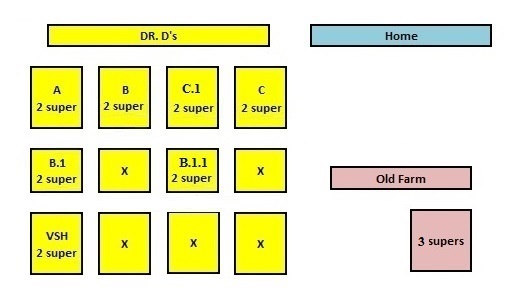 I also added an empty super of freshly waxed frames to Hive-B.1.1 – that gives all the hives two deep supers at Dr. D’s. I harvested a deep super of honey from the old farm. 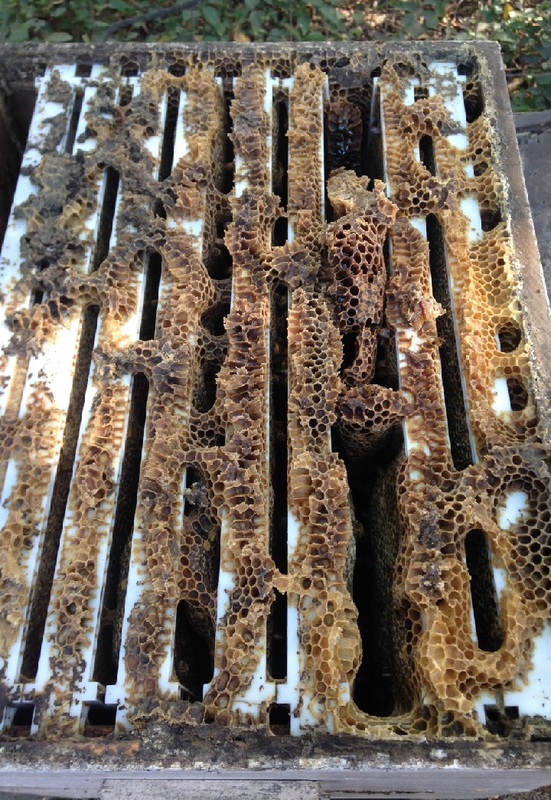 The odd thing was that there were supersedure queen cells in that hive – though they seemed a little old and there was still plenty of brood. I think it’s okay. I’ll still need to winterize the hives this month but for now, it is still in the 80’s and the goldenrod is in bloom. Final Count – 8 hives.